Home | Metal Prices | Global Precious MMI: Record-Low Prices Mark this Month – Are More Drops Coming? 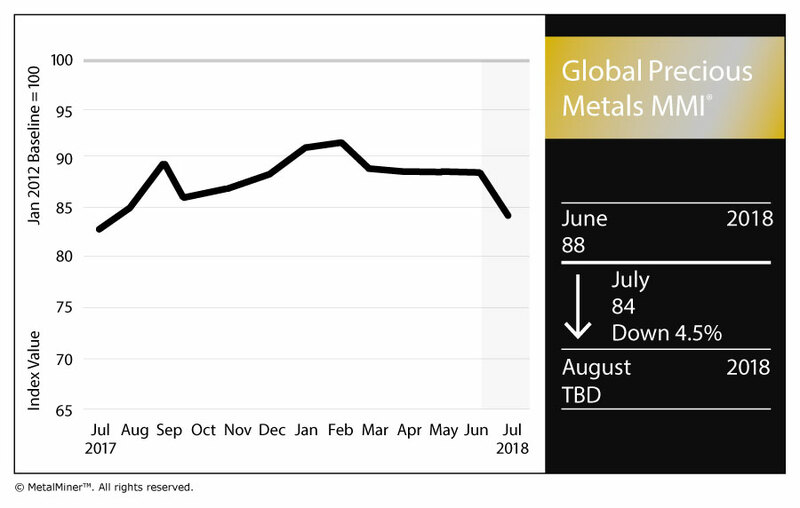 MetalMiner’s Global Precious Monthly Metals Index (MMI), tracking a basket of precious metals from across the globe, dropped four points (a loss of 4.5%) for the June reading after holding flat for three straight months. Incidentally, the July 2018 MMI value hit its lowest point since exactly one year ago, when it last clocked in at 84. Individual price points within this precious metals basket hit some historic lows as well. The U.S. silver price hit $16.09 per ounce for the July 1 reading, the lowest since January 2017 (when it took an anomalous dip down to $15.80 for one month before bouncing back up). 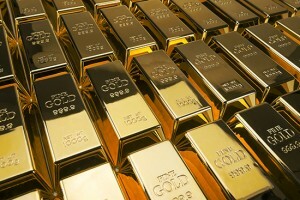 U.S. gold bullion has languished back down to the mid-$1,200s, a one-year low. And both platinum and palladium have come off considerably, with the U.S. bar price of the former dipping below $900 per ounce for the first time since February 2016. Keep an eye on the U.S. dollar. A stronger dollar of late, which had gotten a bump from recent better-than-expected U.S. manufacturing data at the beginning of the month, pressures platinum prices because “it makes greenback-priced precious metals more expensive for holders of other currencies,” according to Reuters. Gold is also in the crosshairs of a stronger dollar. In fact, that has become “the biggest obstacle” for gold prices in the near and long term, according to a recent JP Morgan price forecast report cited by Kitco. The threat of auto tariffs has also burned platinum pricing. Due to the pricey PGM’s use in diesel engines, “the threat of protectionist policies has fueled bets that slower trade activity will disrupt the global economy, reducing commodity consumption” — including that of platinum in cars, according to the Wall Street Journal (paywall). While the product contains trace amounts, at best, of gold’s shiny, less expensive cousin — not to mention that it’s fake — Alexa Silver is still pretty hilarious.